Auto Top-Up is a feature that is available to all professionals on Bidvine. It makes it even easier for you to purchase credits and send bids. With auto top-up turned on, you'll always have enough credits to send bids. With auto top-up enabled, your payment method is debited in the same way as if you were making a regular purchase, except you don't need to approve each recharge. A purchase is triggered when you require additional credits to bid on a customer's request. How to enable Auto Top-Up? Select "Credits" from the main navigation and click "Edit"
Select the bundle you wish to have automatically applied to your account when you run short on credits from the menu. Alternatively, you can select pay-as-you-go, which means that you'll only be charged for credits as you need them. Simply log in to Bidvine and navigate to your credits page. Here you can simply add another credit card, debit card or PayPal account. 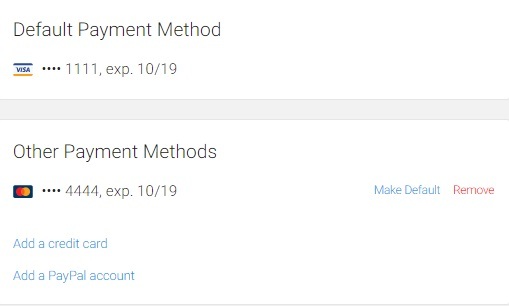 Once your new payment method is added, you can either keep or remove your previously entered payment method. How do I change the Auto Top-Up amount? Simply follow the same steps outlined above, and you can change the amount of your Auto Top-Up bundle or switch to Pay-As-You-Go at any time. How do I turn off Auto Top-Up? Follow the same steps outlined above to get to the Auto Top-Up settings. Once there, simply click the toggle switch to disable this feature. Please note that credits are more expensive when purchasing via the app. This is due to the markups charged by Apple or Google. To get the best prices on credits, purchase them directly on Bidvine.com.